What’s the story in Rutshuru? Rutshuru is a territory in the province of North Kivu, in DRC. It shares borders with Rwanda and Uganda, and includes a large portion of the Virunga National Park. Ethnically, Rutshuru has over 800,000 inhabitants from many tribal backgrounds: mainly Hutu followed by Nande, Hunde, Tutsi and Pygmée. Since 1993, Rutshuru has been ravaged by inter-ethnic wars, causing thousands of some tribes to be expelled from the region. In 1994, Rutshuru became an open door to thousands of Rwandan refugees, fleeing from the Rwandan Genocide. From there, the 1996 First Freedom War caused unbearable damage, including the death of thousands of these Kinyarwandan people by armed groups from Rwanda, Uganda, Eritrea, Somalia and Ethiopia. The formation of the CNDP armed group in 2006 had a high proportion of Hutus from Rutshuru, a movement which has made other ethnic groups, such as the Nande, create their own armed resistance groups in response. The creation of the infamous armed group M23 in 2012 also had its roots in Rutshuru (most of the members having previously been part of the CNDP), having serious implications on the lives of the population living there until their surrender to government forces in 2013. 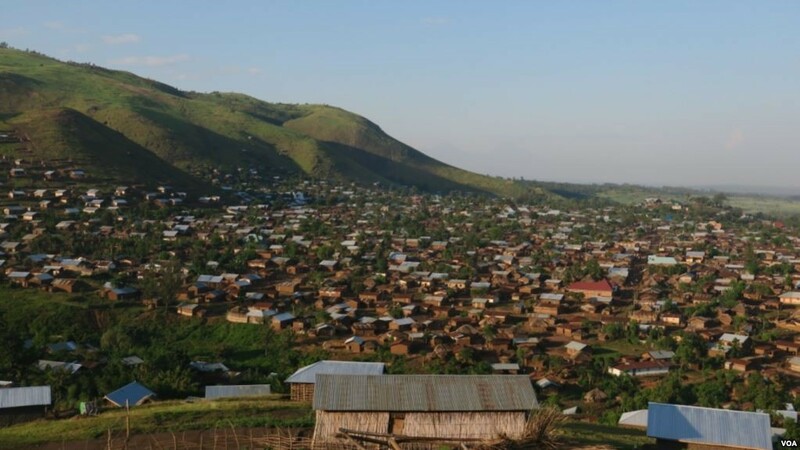 Peace was short-lived and from 2016 to the present day, Rutshuru still faces interethnic tensions between different tribal groups, leading to the displacement of the civil population. These events have had huge impact on the population of Rutshuru, with large numbers of children groomed forced to join military or armed rebel groups, a huge increase in the number of orphaned or abandoned children due to conflict, illness or displacement of families, and has led to mass unemployment along with damage to the economy. Although many Non-Governmental Organisations (NGOs) have established themselves in Rutshuru, they only intervene in emergency situations and not in community development, which in turn means the population is entirely dependent on the organisations and unable to move forward independently. After so many wars, the people of Rutshuru have found themselves unemployed, without access to education or the necessary social and economic opportunities. The people of Rutshuru are trying to get on with life and to make the most of what they have. When we visited in April 2018, we met with the local authorities and were shown around their brand new youth training centre (funded by NGOs) which has already started enrolling young people. We visited the football field, which is still used despite the football stands being destroyed during fighting – they are now trying to rebuild. We visited their tiny public library and heard of their hopes to teach reading and to show educational films. The young people have been subject to the conflict, often having to abandon school to work in their family fields to support food production for the home. Where conflict has hit their villages directly, many young people have had to quickly flee and live displaced from their homes, many losing family members in the process. 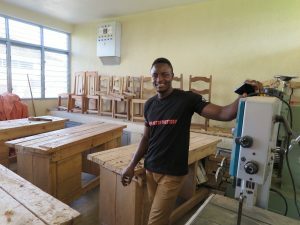 Some young people have sadly taken part in the conflict by enrolling into armed groups, whether by choice or through force: a considerable amount of the general workforce who were there to invest and develop the territory of Rutshuru were enlisted in armed groups during the most recent conflicts. With all this going on, there was just a small voice rallying for peace: some young people began to communicate about the benefits of and need for peace but, facing pockets of resistance from those engrained in conflict, and lacking the drive or leadership of someone who could supervise their development, that voice remained quiet. From numerous visits to Rutshuru and time spent with the local authorities and young people there, it became clear that the young people needed access to good leadership and entrepreneurial training. There are also huge barriers to overcome around working together in teams with others that they don’t know or who are from other backgrounds, due to the history or ethnic conflict. There is a distinct lack of vision or hope for a better life and, above all, a noticeable lack of self-confidence caused by years of living for survival with little-to-no individual awareness of skills and opportunities to do things differently. How is The Congo Tree making an impact? We know that young people can be the best drivers for change. To be this, we know that young people need to have a love for where they live and the people they live alongside, a hope that things can be better, and the skills and knowledge to make it happen. A changing outlook will lead to their participation in the process of stabilisation and governing at all levels. However, in order for this to take root, there needs to something to inspire an understanding of positive leadership and to equip young people with the knowledge of their entrepreneurial and personal skills. A leadership programme is extremely important for young people in Rutshuru to support them as they journey through the process of changing mentality and seeing how they can drive for change, create opportunities and strive for peace. This is where the WYLD programme and The Congo Tree comes in. We began our first WYLD programme in Rutshuru in November 2018! We believe that, thorough the WYLD programme in Rutshuru, the youth will become more self-aware, will develop confidence in their strengths whilst developing new skills, and will begin to trust one another as they are challenged to work together. Through their social action and enterprise projects, they will be able to start working on the development of their territory and will model a new way of working with others. If the young people can share their changing worldview with others in this way, we know they will be on the journey to seeing positive change in the whole community.